This weekend's releases look a little on the weak side so I figured I would go back and discuss another of my favorite movies from last year. Winter's Bone is essentially a film noir set deep in the Ozark Mountains. Like winter in the mountains, the film is cold and unrelenting. You won't have fun watching this movie and it won't make you feel good when it's over, but it tells a great story with well drawn and realistic characters. That isn't to say the film is completely humorless but it is good to be prepared for the dismal mood of Winters Bone. The movie opens on Ree Dolly (Jennifer Lawrence) taking care of her two younger siblings and her own mother. She's obviously only a teenager but looks aged beyond her years. With no money to take care of her family, Ree is just trying to keep her head above water until she can figure out what to do. Soon a cop pulls into the yard and tells her that her father, a known meth cook, has skipped out on his bail. If he doesn't show for his fast approaching court date she will lose her house, which her father used to post bail. From here the movie follows Ree on her quest to find her father and save herself and her family. This will bring her to places she knows she isn't supposed to go and will disrupt the uneasy peace of her feudal mountain town. There is an overwhelmingly constant fear and dread that soaks through this film. Every new character Ree meets and every situation she finds herself in you know is going to lead to trouble. You never know where or when it will happen, but you know her snooping around will ultimately catch up to her in a big bad way. This feeling is conveyed perfectly through director Debra Granik's quick pacing and use of darkness or shades of gray in every shot. Each day looks just as bleak as the day before. You get the feeling that this is just how life is for the people who live here and this is how it will always be. Jennifer Lawrence is fantastic in the lead role. She brings a sense of both strength and weakness to her character at the same time. She understands her place in the hierarchy of her existence but she knows that in order to solve her problem she needs to buck the system. There are a few spots in the film where it seems like her body keeps marching forward while her mind is still hesitating. The other standout role in the film is her uncle, Teardrop, played by John Hawkes. Explaining the ways and directions his character develops would ruin one of the best parts of a great movie. I'll just say it's a great understated performance in a role that could have been ruined by overacting. The way Hawkes portrays the character seems real. I've met people in my life who look and act like that. Summary: Winter's Bone is an excellent film. If you're looking for some escapist entertainment then I'd look for something else. However, if you're looking for something that will stick with you and throw you around a little bit, Winter's Bone is your ticket. A. Brick is a perfect companion piece for Winter's Bone. It's a modern film noir with a teenage main character. The color pallets of both films are very similar, as is the ever-present feeling of despair. This is one of the films that introduced Joseph Gorden-Levitt as a dramatic actor to be reckoned with much like Winter's Bone is sure to do for Jennifer Lawrence. I love the 1930's era hard-boiled dialogue and it's one of the elements in the film that keeps it from feeling overly realistic. This makes it's impact somewhat softer than that of Winter's Bone, but no less fantastic. 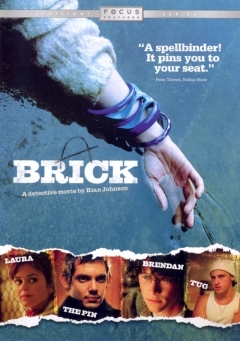 Brick is one of the best of it's genre. Many of the actors cast in Winter's Bone are locals from the town where the movie was shot. This helps it achieve it's realistic tone. 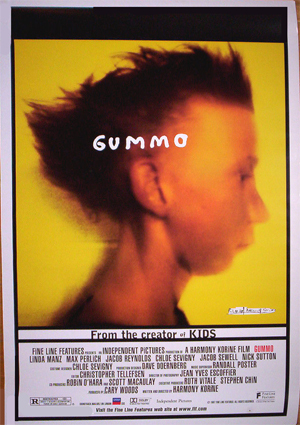 Gummo is another film that uses local actors to try and achieve a similar effect. I wrestled with whether or not Gummo is actually a bad movie since I first saw it. I've come to the conclusion that it's too pretentious and self-congratulatory to be taken seriously. It's a film that tries so hard to be "art" that it misses the mark. It has the same poverty-stricken look and feel of Winter's Bone with none of the character. One scene of the film shows a kid with rabbit ears drowning a cat. That is so edgy and hip!...please. Hey Jeremy. I LOVED The Gift. It seems very overlooked in Raimi's body of work. And a really good cast, too.